"We are the music makers, and we are the dreamers of dreams." It's these resonating words — spoken by Willy Wonka in the original film adaptation of Roald Dahl's Charlie and the Chocolate Factory — that open Lange's new artist album, 'We Are Lucky People'. Layered over sweeping symphonic arpeggios, this introduction sets the tone for the rest of the album — an expansive double-feature, with a set of masterfully crafted singles and an accompanying disc of reworked club mixes. The third artist album from Brit producer Lange, AKA Stuart Langelaan, it's also the most involved production the veteran producer has taken on. Featuring a myriad of collaborations, reworks, and original tracks, the album began gaining momentum months ago when Lange started releasing singles in a build-up to its release this month. Making waves across the digital scene, individual releases such as galloping piano anthem 'Destination Anywhere', flew into the Beatport charts and beyond, infiltrating podcasts and DJ sets of artists around the globe. We catch up with Lange on the cusp of the album's release to learn some of the story behind his sound. From his development as an artist to his thoughts on the current state of trance, Lange openly details the life of a trance kingpin. If one thing is certain, it's that his music is all the assurance we need to know that we all are, indeed, lucky people. We Are Lucky People marks your third artist album. What does the album title mean to you? How do you feel you've progressed as an artist through each album's milestone? You've been on the scene for over 15 years now. What are the biggest changes to the industry and the music that you've seen over the length of your career? “A lot has happened in those 15 years, the biggest changes being to music production and marketing. When I started, I had a relatively basic home studio. Bearing in mind, I'd not long finished university and didn't have a proper job at that point; getting the gear together itself was quite an achievement. I was using an Atari ST running Cubase and hardware I'd gradually bought as I could afford it (thanks Student Loans company). So everything took longer, you had to save all the data from each synth and effect, and even write down all the mixer settings in case you needed to revisit a track. Now it's a simple case of pressing Ctrl S on your Mac. “Also, everything was so expensive, I recall upgrading my Akai sampler, adding an extra 1.5MB of memory for a whopping £350! Creativity-wise, improvements with software have meant there are few limits on what's achievable in the studio now — although I have to say sometimes having so much choice can be a problem in itself. The arrival of the internet connected us to a whole world of dance music lovers, but resulted in a massive drop in sales due to piracy. The major labels were far too slow to make music available digitally and so a generation pretty much got used to music being something you grab for free. As a result, DJing and live performance has now become the main income for artists in EDM. I guess that's the reason so many DJs have outsourced much of the production work — the most challenging work — to ghost writers. The problem is, this results in a lot of artists sounding the same! 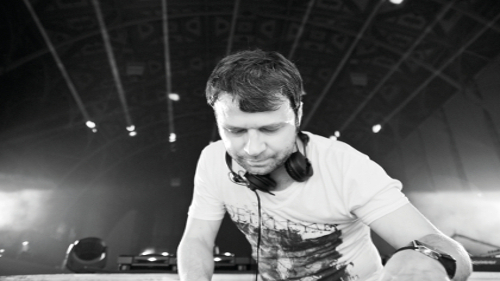 “Trance music itself has changed a lot in this time too. Generally BPMs have come down and it's not all about the saw riffs of the late '90s. You've collaborated with some phenomenal vocalists, not only in 'We Are Lucky People' but also in your past work. What is the process like in working with different vocalists and how involved are you in the lyrical process? Rewinding a bit, how did you get your start producing? How have you evolved as a DJ in relation to your own productions? “When I was at college doing A Levels I realized I wanted to produce, and by the time I'd finished uni I had a low budget studio set-up. I actually got my break after sending demos to Future Music magazine, which attracted some label A&Rs. Once I made that connection I signed to Additive records (sister label of Positiva.) They gave me my first remix work and I ended up having a few remixes hit the UK charts, including 'Protect Your Mind' (No.4) and 'Happiness Happening' (No.18.) At this stage my studio was still in my bedroom and was very basic — I mean some of my effects units were cheap guitar units and I had a cheap analog mixing desk! This catapulted me into the scene and I became a pretty in-demand remixer at that time… I recall having dozens of remixes queued up at one point! How has your perception of your own music changed over time? What are the most notable differences between the trance scene in the UK versus the US? Do you feel as strong a connection to the scene in the States? “The UK seems to have quite a polarised view on what trance is. Ask clubbers north of London and they say it's got to be at least 138bpm with a rolling bassline. I've played clubs in the north where a resident DJ before me has typically said, 'you'll need to keep it up at 140 mate'. Well, I'm sneaky and I've managed on many of those occasions to creep the BPM down to 132 with no apparent loss of energy or reactions. BPM isn't the key factor — it's actually an easy way to give a track more energy, but groove just disappears at those speeds so I prefer to produce between 130-134. Stateside there are far less preconceptions about what trance should be, but that probably is because they didn't go through what we did in the UK back in 1998-2000. But, now that EDM has erupted in the USA, it seems trance may be getting a bit lost over there amongst all the big room drops. Play after any DJ smashing it out with the most epic of quick mixed EDM slammers and you'll be hard pushed to get the crowd's attention with anything particularly emotive or melodic without a cunning set progression (I always revel in the challenge). I'm happy slamming it out with the more inventive tracks out there, but there's a lot of the same old same old; it's become generic. Trance is a genre that is typically associated with unity and acceptance, yet when artists divert from the “classic” sound there can be a lot of backlash from fans. What do you attribute that to and what do you see for the future of the genre? You celebrated the 100th episode of your Intercity radio show with an incredible 24-hour worldwide broadcast. What went into creating the concept and how did you go about selecting the artists involved? How crucial do you think the presence of podcasts and radio shows is in today's technology-driven music scene? Owning your own label, you must be constantly exposed to new music. What emerging styles and sounds do you see as the most promising? How do you deal with the nonstop influx of music? Where do you see the scene, and yourself, in three years?